Tonight I went with my friend to see Mary Poppins Returns. I thought it was good, but a bit on the long side. The best scene did not happen until almost the very end of the movie. There are several movies that came out in the last week that I would like to go see. Have you seen any recent movies, and what did you think of them? It's the final stretch before Christmas. I am still having a hard time dealing with how fast these last few months went. My question for this party.. Do you plan on doing some last minute shopping this weekend, or staying far away from the stores? December is already halfway over! Where is the time going? Just a few more days of school and then off for a two week holiday break. Do you have any fun plans during the holidays? It is time to get this party started! Hey there party goers, this time I am actually writing this post early. For those who were following along last week, my beloved Buckeyes won big over their biggest rival Michigan. If you are wondering what TTUN means in the comments, it is one of the many things we use when referring to U of M.. It stands for That Team Up North.. This weekend we will now have to play Northwestern on Saturday night, to become the outright Big 10 champion. (who actually has 14 teams now). My question for this week.. Do you have your Christmas tree up yet? I do not, but I am going to help a friend get hers up tonight. My daughter needs to pick up some of her things, before we put ours up. Hopefully everything will be done this weekend. It is Saturday morning, and you know what that means. I am sorry I am a bit late getting the party up and live this weekend, but I have a good reason. I got stuck in a snowstorm last night. I went to the Friday night dance with a friend. When we left the weather was just a little rainy, but not that bad. We had a really nice time at the dance. Since my friend was busy meeting new people, and we had to leave early the last time went, I allowed my friend to decide when it was time to leave. Umm.. that might not have been the best decision. What we did not realize was that while we were inside having fun, outside it was snowing, snowing A LOT. There were a couple of inches already on the ground. It was very windy so the snow was blowing hard. The roads had not yet been plowed or even salted. You could not see the lines of the lanes, and they were very slick. Instead of taking only 45 minutes to get home like usual, it took an hour and 45 minutes. I got home just a little bit before 2 am, and was exhausted. I had planned on getting up a bit earlier to post, but I guess I needed the sleep.. In other news it is a big day in FOOTBALL at my house. My Buckeyes are playing Michigan State (one of our bigger rivals) and Penn State (a special friend's favorite team) is playing Wisconsin at the SAME TIME! It is very important that OSU wins this game to stay in hunt for the Big Ten Championship! I better get this party started so I can watch two games at the same time.. LOL! Sorry a little late to get the party started. We went to see the new movie Bohemian Rhapsody tonight. I really liked it. I grew up listening to many of their songs, so it was kind of cool to see the story behind them. What is your favorite Queen song? It is time to get this party started. Just got back from the Halloween dance where we celebrated my birthday a few days early. 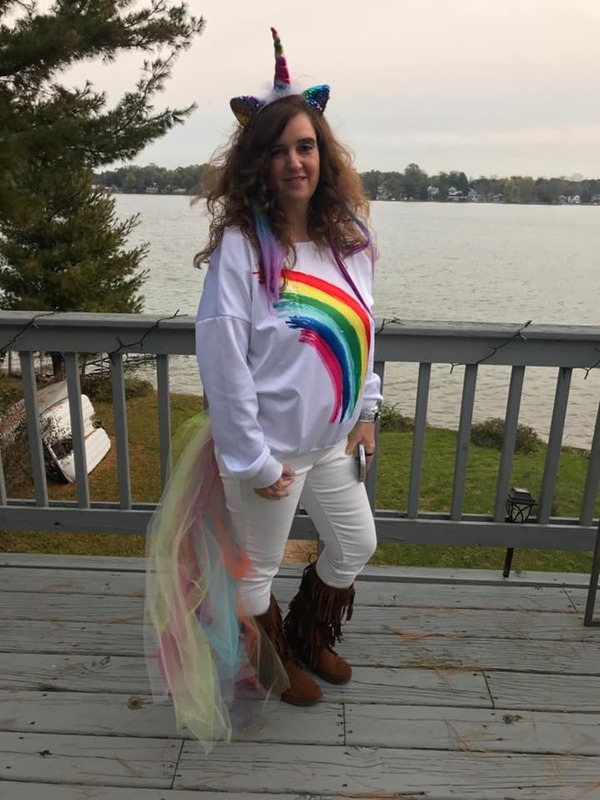 I thought I would share my unicorn costume that I put together with many items I already had. It was fun and easy to dance in, and I am pretty sure I will wear it again. It is time for this week's party! October is flying by! This week I have been working on my costume and getting ready for my birthday that is coming up later this month. 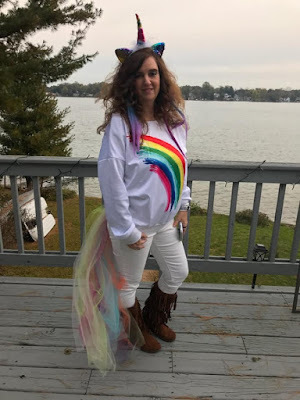 I think I got everything but my unicorn tail. I have been trying to think of a couple different ways to make it. I need to be able to sit down comfortably in it. Football season is also in full swing. Today at school with had wear your color day for an interstate rivalry where I do not like either team. Instead I was a rebel and wore my scarlet and gray in that state up north.. LOL! All day it was fun to watch those 5th grade minds blown when they realized I was not a fan or U of M or MSU. What team is your favorite team to cheer for? Are you having crazy weather where you live? In the last few days we have had a ton of rain, lows in the high 30s and, highs in the low 80s. It's hard to know what to wear day to day. I know in the northern part of my state today they had SNOW.. eeek! It is time to get tonight's party started.. I hope everyone in the path of Hurricane Florence is staying safe and dry tonight. I am going to keep this short and sweet, and get the party started. School started back this week, and suddenly I feel like I am in a time warp. It has still be very hot here, (90+) through most of this week, but everywhere I look is Halloween and pumpkin spice.. I am in no hurry to jump to the holidays, my head and heart are still in summer mode. How about you? Do you start dreaming of fall and Halloween on Sept 1st, or does it take you a few weeks to adjust to a new season like me? Labor Day weekend. The end of the summer. I truly do not know where the time went, and how it flew by so fast. School for us starts on Tuesday. Once school starts the months start to go at a super fast pace, and before we know it, it will be the holidays and the New Year. Does anyone else feel that way? Do you have plans for the Labor Day weekend? Let's get this holiday weekend party started! It is Back to School crunch time. This week I got my youngest registered for her high school classes, and son for his COLLEGE classes. He is going to take three classes from a community college nearby. I am almost ready to go back to class as well. Have the schools in your area started back to school yet? I am heading out shortly for a girls night with several friends. Since I assume it will be a late night, I scheduling tonight's post so it goes live on time. :) We are trying to squeeze out whatever summer time we still have left. How about you? Are the schools back in session where you live, or are you still celebrating summer?